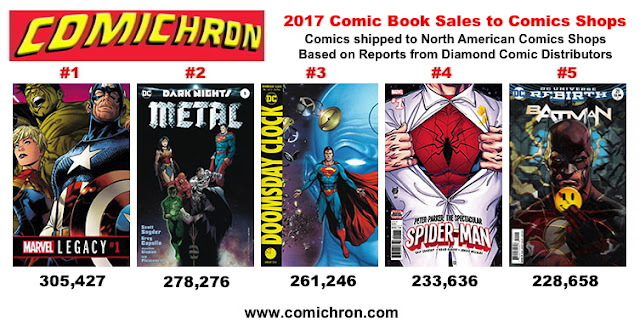 With the release of December comics orders from Diamond Comic Distributors — and our subsequent analysis of and estimates for December 2017 comics sales now posted — Comichron has drawn upon that information to project estimates for the Top Thousand Comics and the Top Thousand Graphic Novels for 2017. The tables are on the page just beneath the image links to individual months. This year's charts have our sorting and searching features implemented, as now do our previous 26 years of annual charts, going back to 1991. You can find the links to them, along with updated comparatives for how the market as a whole did across that time, by viewing our Yearly Comics Sales page. 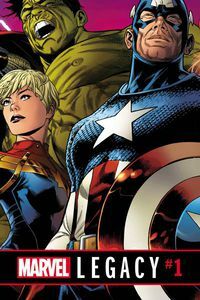 Led by Marvel Legacy #1, the Top Thousand Comics accounted for around 49.68 million copies; Diamond reported it sold 89.44 million copies altogether, so that's about 55% of all copies. That fraction is down from around three-fifths two years ago, and underscores the degree to which the charts have gotten less top-heavy. It's also a reason why Diamond shifted to reporting the Top 500 comics monthly; the market is fragmented such that more sales are outside the top portions of the charts. As you can see, 2017's figure comes in under 2012's — but we already know that Diamond sold more comics in 2017 than in 2012, so this is again a consequence of the Top Thousand representing a smaller portion of the distributor's volume. In full retail dollars, the Top Thousand Comics likely sold for $190.6 million, just a smidge under the 2012 figure; the same observation applies. Almost everything in the Top 100 had "multiple order codes" at Diamond, meaning there were variant covers or reprints combined into one entry; sometimes it's not a simultaneous variant, but rather a reprint with a different cover. Very standard, by now. The dearth of hits isn't as bad as it appears in 2017, because of Diamond's practice of listing variants with different cover prices as separate entries; in truth, there are five books above 200,000 copies when Doomsday Clock #1 and Batman #21's versions are fused. Taking the chart as is, however, just 99 comics topped 75,000 copies in 2017, less than half the sum projected as the minimum for 2016, when Marvel was doing better and when DC had its Rebirth launches. And yet, the industry was still moving the same number of different titles, we can see: 2015 was a much better year than 2017, and yet retailers ordered at least 25,000 copies of the same number of titles, 1,166, in each year. Every year we also add a number of items to the Top Comics of the Decade and the Top Comics of the Century (So Far, in each case) lists. As you might expect — especially in a year with no Loot Crate activity — a smaller number of new entrants made the lists, and at lower ranks. The year 2017 added 26 comics to the 300 bestselling comics of the 2010s, with Marvel Legacy #1 placing 20th, and 15 comics to the 300 bestselling comics of the 21st Century, with Marvel Legacy #1 placing 25th. 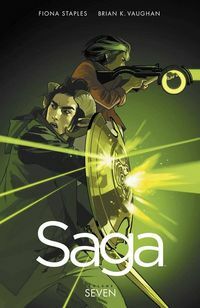 The Top Thousand Graphic Novels, led by Saga Vol. 7, went for $73.19 million. We again counted up all the graphic novels Diamond reported in 2016 to come up with a minimum for that year, and for this category the estimate is definitely too low, since graphic novels sell every month of the year but only a few get to chart every month. It's probably more like $80 million. Combined, the Top Thousand Comics and Top Thousand Graphic Novel lists account for only a little over 50% of all the orders by dollars Diamond received for print products in 2017. That's again a drop, down from around 55% in 2015. As they were earlier this decade, the the top-selling books accounted for less of the pie; unlike earlier this decade, the pie didn't grow in 2017. I don't want to compare these with the provisional 2016 list, but versus 2015 diversity in the table took a huge hit, with many fewer publishers represented and Image's share cut down. I again don't want to compare these with the provisional 2016 list, but versus 2015 there are fewer publishers with 10 or more titles. Marvel, Image, and Viz have more entries on the list this time, with Marvel nearly catching DC. So that's the year that was. There are a few more housekeeping things to do on the site to update it with 2017's data (and of course, I have many previous years' information that I'll be posting soon). In the meantime, on to 2018 — and hopefully better weather, sales and otherwise!